Golden State Communications can help you communicate at the touch of a button with the WAVE™ TLK 100 rugged two-way radio. Purpose-built for business, everything about the WAVE two-way radio is smart and intentional. Whether it’s location tracking and Wi-Fi calling or the rugged design without an attention-diverting screen. Group communication can now include those who rely on smartphones and tablets as well as two-way radios. Eliminate communication barriers between the traditional office space and the commercial and industrial areas. A predictable, low-cost per user subscription fee and no long-term commitments make it easy to manage your cash flow. Accelerate the Flow of Information within Your Organization and Increase Productivity with Secure, Affordable Push-To-Talk. When it comes to speed, nothing is faster than push-to-talk and there’s no faster way to get started than with a WAVE cloud-based subscription. Your team can be up and running in less than an hour and you get predictable costs without long-term commitments. Fast, secure and reliable PTT voice communication at the touch of a button. Coordinate a meeting place or share your location with your group members. Send a text message to a group or individual using your PTT groups and contacts. WAVE OnCloud offers a predictable, low-cost per user subscription fee with no capital expense or long-term commitments. Motorola Solutions offers three different plans that cover the needs of modern startups and businesses. They are provided via monthly or annual payments for your convenience. WAVE OnCloud is a push-to-talk subscription service from Motorola Solutions. It connects teams at the push of a button across different networks and devices. It eliminates the barriers between devices, networks and locations to let everyone be part of the conversation. What is the WAVE two-way radio? 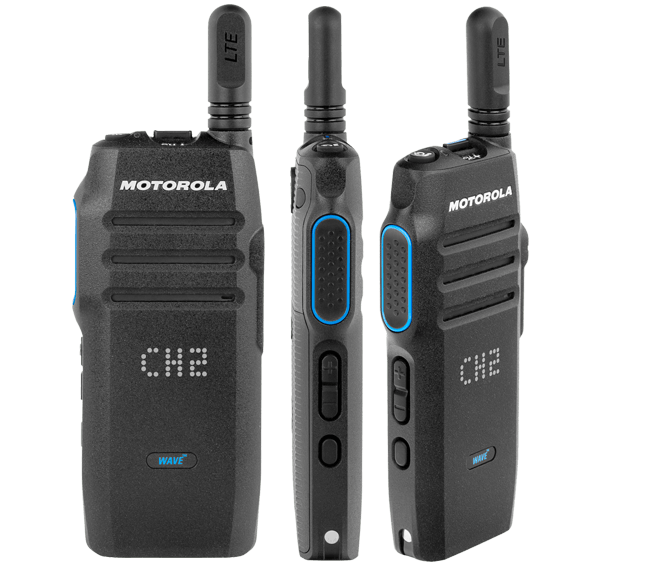 The WAVE two-way radio provides businesses with instant push-to-talk team communications over a nationwide LTE cellular network. 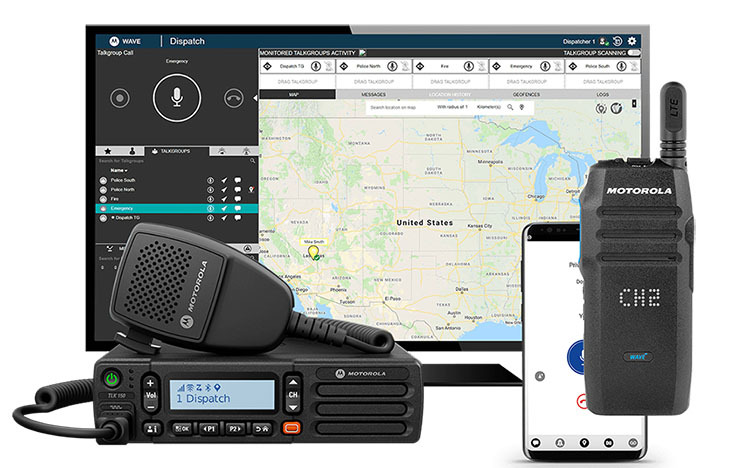 This one bundled solution including the radio, cellular service and software is built specifically for the demanding needs of businesses with a geographically dispersed workforce. What types of businesses will use the WAVE two-way radio? The device has a traditional two-radio form factor and does not have telephony capabilities. What cellular network does the WAVE two-way radio utilize? Customers will not need to worry about subscribing to a specific carrier network. They will subscribe to Motorola Solutions’ WAVE wireless service, which leverages the nation’s best carriers for service. With so many versatile radio models, PTT options and applications available to unify your team, it can be tough to be sure you are putting the right devices and applications in the right hands of the right workers. Farmers' access and use of mobile wireless technology have increased rapidly over the last few years. The benefits of the adoption and use of next-generation Push-to-talk Over Cellular (PoC) wireless technology in agricultural production are substantial. Eliminate the barriers between devices, networks and locations and let everyone be part of the conversation. © Golden State Communications, Inc. All Rights Reserved - Motorola Solutions Radio Solutions Channel Partner California. MOTOROLA, MOTO, MOTOROLA SOLUTIONS and the Stylized M Logo are trademarks or registered trademarks of Motorola Trademark Holdings, LLC and are used under license. All other trademarks are the property of their respective owners.© Motorola Solutions, Inc. All rights reserved.